Children learn by example. We believe in teaching them early on how to keep their teeth clean, healthy and white. Going to the dentist seems like a scary thing for a lot of kids. 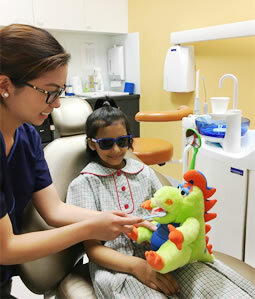 Here at Parramatta Dental Clinic, we believe that a child’s trip to the dentist should be a smooth and fun experience. Our Oral Health Therapist Iza has years of experience seeing children and adolescents up to the age of 18 and works closely with parents or guardians to provide the best care for her patients. Get in touch with us when your child’s first teeth start breaking through their gums. We’ll teach you how to care for your child’s teeth and how to ensure excellent oral hygiene as they grow. As time passes, you can start bringing your child to us every six months to help them get used to the dentist and the dental clinic. 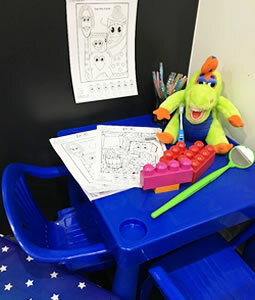 Kids will have fun at our Kid’s Corner. We also provide personalised oral care instructions and dietary tips to help your child stay healthy and cavity-free. Make Brushing Fun at Home! We know that getting kids to brush their teeth well can be tough. So why not download and try these apps to make brushing more fun for your kids! With every visit, your child will become more familiar with our dental clinic, and learn lifelong skills of proper oral hygiene. Contact us today on we’ll be more than happy to take care of your child.